This exceptional piece of furniture is majestically designed in the Louis XV style, featuring graceful curves and exquisite Vernis Martin painted panels. 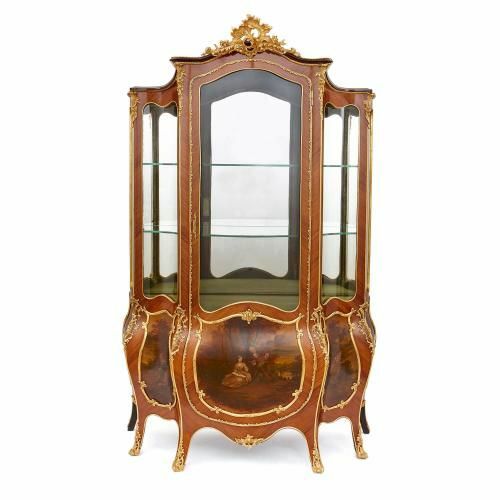 Standing at nearly two metres in height, this large and impressive antique vitrine, or display cabinet, has been designed for the finest luxury interiors. 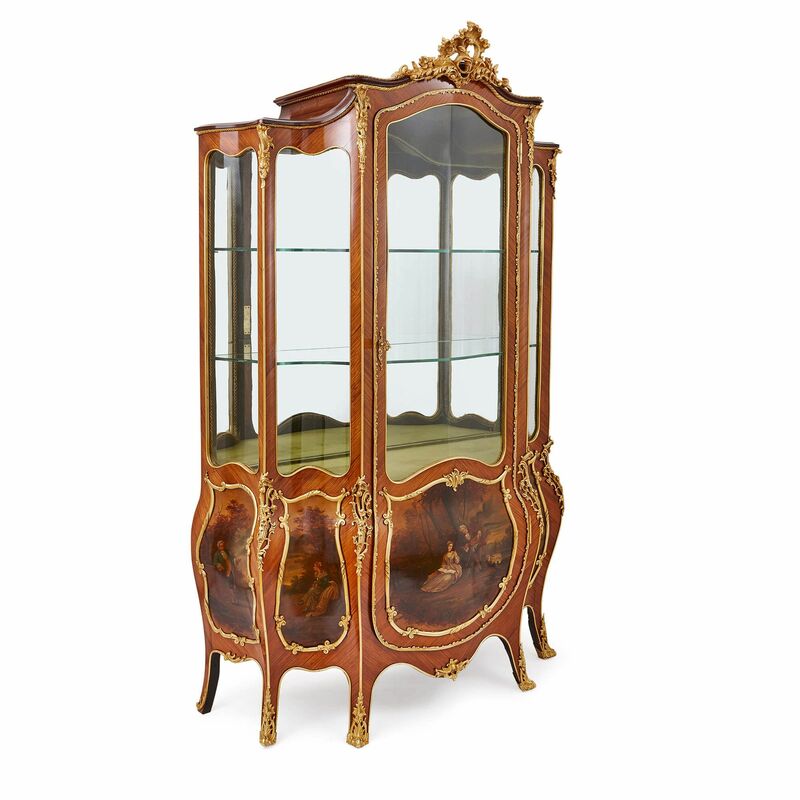 Combining vibrant forms with luxurious materials, the vitrine beautifully embodies the finest elements of the Louis XV style. The bombe-form kingwood cabinet consists of a central glazed apron door with a curved window at either side. 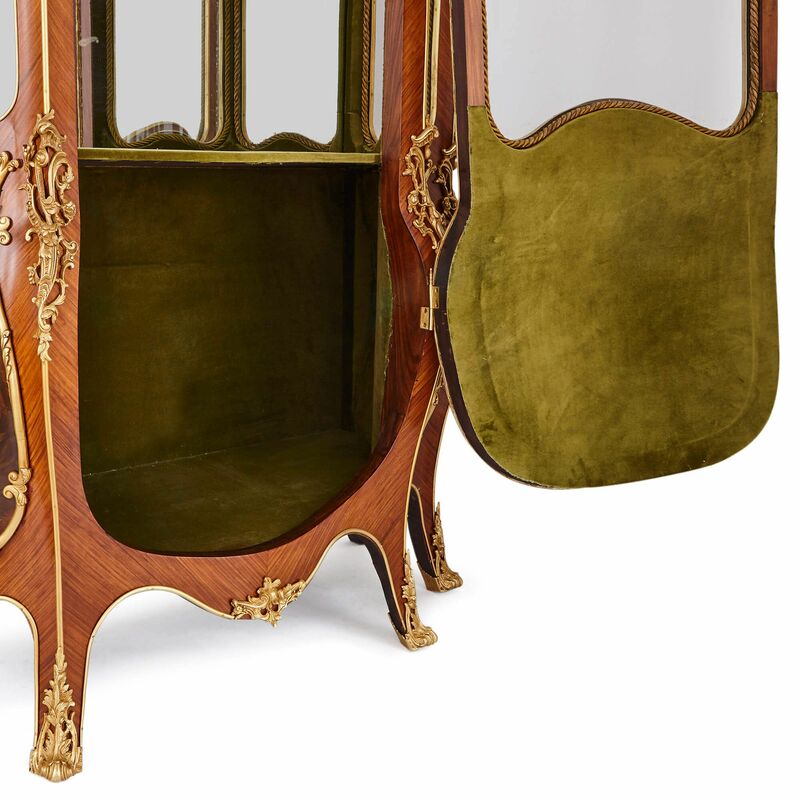 The interior of the cabinet contains two glass shelves with mirrored backing, and the floor of the interior is lined with green velvet. 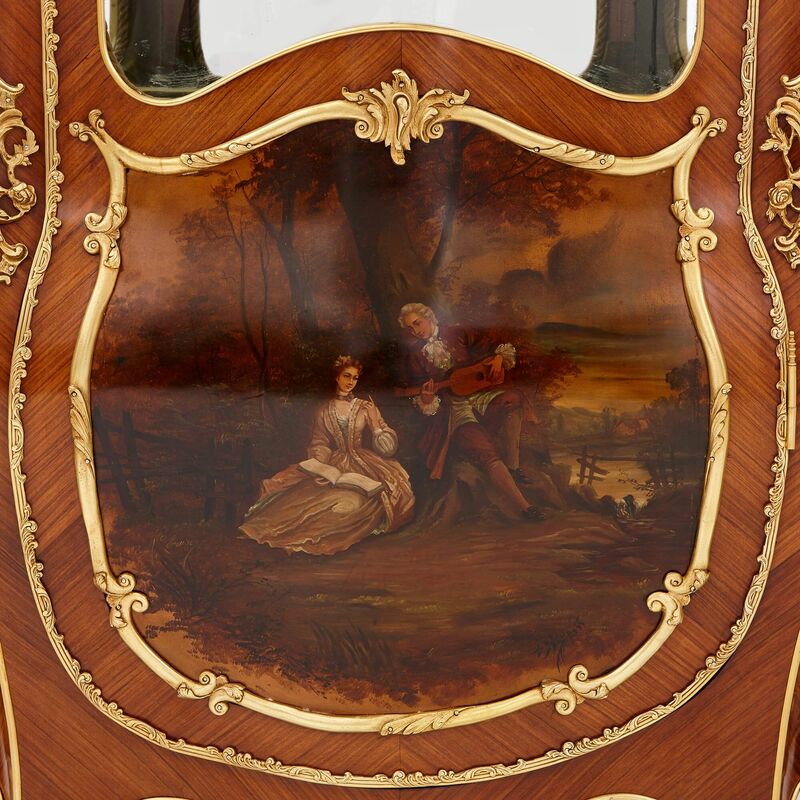 The lower part of the vitrine is decorated with five Vernis Martin (the name for a French variety of imitation lacquer) panels, showing fête galantes scenes. Fête galante refers to a genre of 18th Century French painting, typically depicting elegant men and women in romantic outdoor scenes. The term was first used by the French Academy in 1717 to describe the work of painter Antoine Watteau (French, 1684-1721), and the genre became a crucial part of the development of the Rococo style of painting and decoration in France. 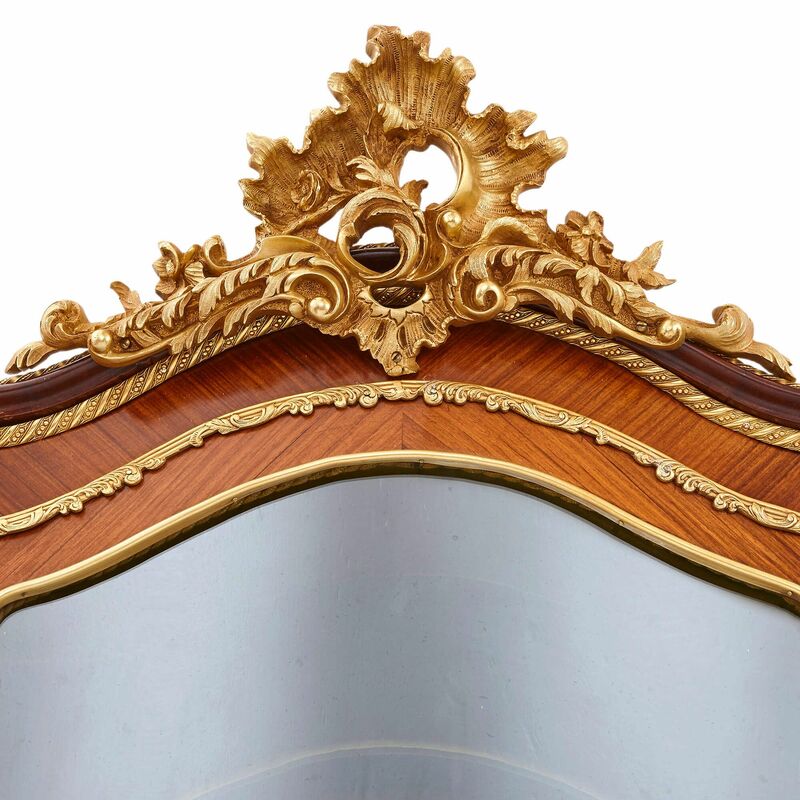 Elegant ormolu mounts grace the edges of each panel, as well as along each corner of the piece. The ormolu mounts take the form of scrolling foliage and shells, and beautifully emphasise the graceful curves of the piece. 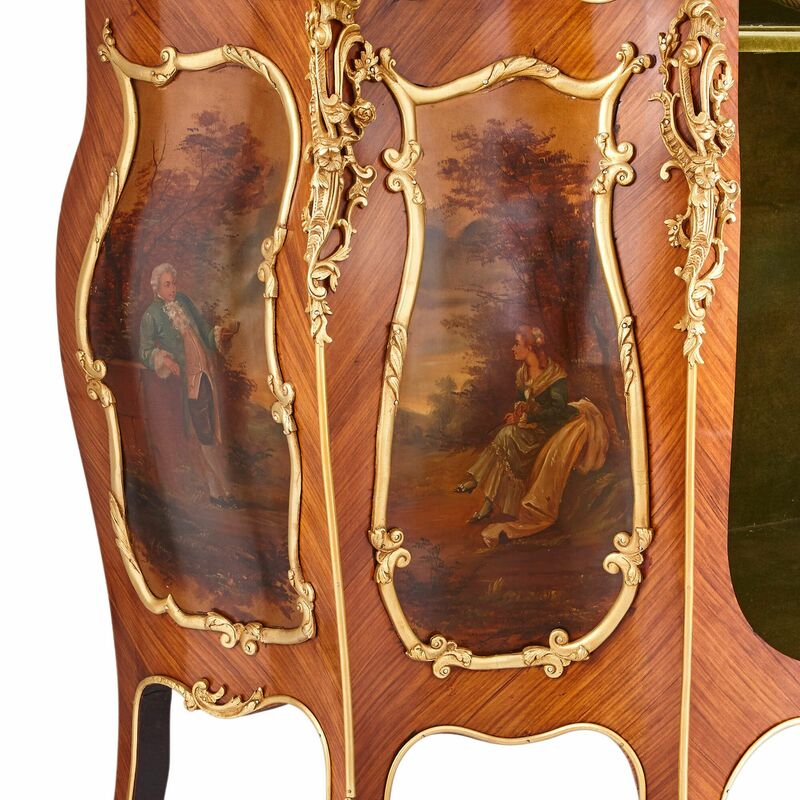 The cabinet is set on six cabriole legs, and is surmounted by an ormolu rocaille design.